Since hitting Copperhead, Sheriff Clara Bronson has been all business. She quickly became embroiled in a grisly homicide investigation while still getting to know her new deputy and handling being a single mom. After the first arc, it looked like Bronson was going to be able to relax and settle in a bit. 'Copperhead' #7 proves there's no rest for the wicked as the action escalates quickly and soon Bronson and Boo are in more danger than ever before. 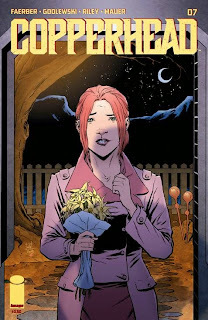 Jay Faerber allows his heroine to let her hair down for a bit and try dating. Her dinner with Thaddeus isn't exactly electrifying, but it's nice to see Bronson receive more character development. We know how seriously she takes her job and her role as a mother but haven't seen a lot of her softer side. It's easy to forget that Bronson isn't just a tough cop but a woman with needs. We actually learn more about her life before she arrived in Copperhead. And because there's never a dull moment in this excellent sci-fi/western/crime procedural, the action escalates quickly. In classic western fashion, a brother comes to town to set his incarcerated brother free. It all goes downhill from there for our heroes. As usual, Scott Godlewski provides some superb pencil work with sharp lines and detailed character designs. Ron Riley paints a wonderful swath of vibrant and lush colors that adds great depth to each page. They just keep pumping out some of the best art in comics. 'Copperhead' #7 launches another compelling arc with intrigue, action, and good old-fashioned wild west drama.